Peter D. Tillman is a mining geologist with two previous fiction sales and many professional and technical publications. He's lived in Arizona for the past twenty years. His reviews have appeared in past editions of Dark Planet and in other publications. 1999, Penguin USA, $6.99, 272 pp. Rating: overall "A" -- best original anthology I've seen this year. Outstanding stories by WJ Williams and Jack McDevitt; excellent stories by NK Hoffman, R. Silverberg and others. Highly recommended. Theme anthologies sometimes suffer from too narrow a focus and/or carbon-copy stories. Not this one -- the authors interpreted the theme loosely enough so that I didn't lose interest. And there are some great stories here. Walter Jon Williams makes a killer take at cybernetic family values in "Daddy's World", and Jack McDevitt delivers the most interesting look at gengineering one's progeny since Greg Egan's wonderfully sly "Eugene," in "Dead in the Water." McDevitt's mother-to-be is particularly well-drawn. A+ stories both; look for them on the award ballots next year. 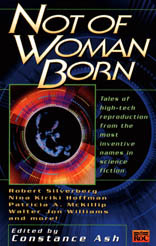 "A" stories: Silverberg's 1957 "There Was an Old Woman" is an amazingly fresh look at cloned lives, even 40 years on. Nina Kiriki Hoffman takes a sharp look at future retail clerks in "One Day at Central Convenience Mall." New author Janni Simner cleverly inverts bringing up baby in "Raising Jenny", and Richard Parks takes a close look at cloning's impact on showbiz in "Doppels."